Though barely a year old, Google Drive is already a very popular service. It’s easy to use if you already have a Google account, and its prices put Dropbox to shame. On Google Drive, 100GB costs a mere $5 a month (and Google even bumps up your Gmail storage to 25GB as a bonus). Dropbox charges double the price for 100GB. But like Google’s Chrome browser, Google Drive becomes even more useful when you take advantage of third-party add-ons and services. These five totally free and easy-to-use tools will help you to encrypt your data, play your music, collaborate on slides, back up automatically, share files, and more. Some live on the desktop, some in Chrome, and some online, but all of them work to make Google Drive a happier online home for your data. You may be too concerned about privacy and security to leave files lying around on a remote server. That’s completely fair, but don’t let it keep you from using the cloud. 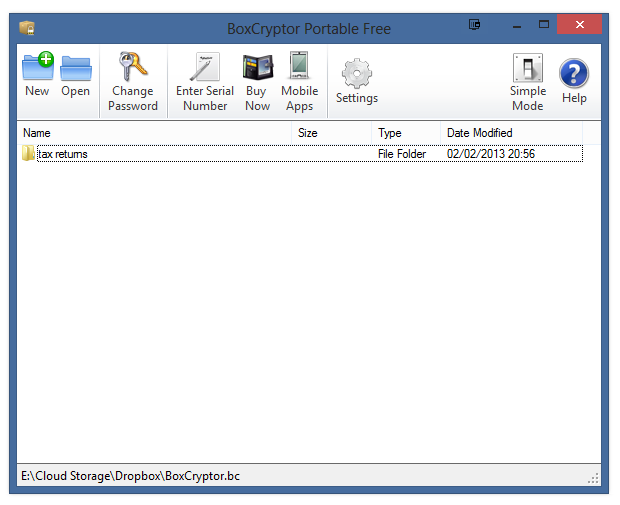 BoxCryptor is a Windows desktop app that creates an encrypted folder that you can place inside your Google Drive folder. BoxCryptor lets you encrypt files and folders, not just containers and volumes. After you create the folder and assign a password, simply drag and drop the files you want protected into that folder. BoxCryptor instantly encrypts and protects them using the AES-256 encryption standard. To unlock the folder and view your files, simply run BoxCryptor, navigate to the encrypted folder, and enter your password. If someone attempts to open the files without the password, an error message will appear. However, only the file’s contents are hidden: The filename and file format are still in plain sight. So for a little extra privacy, change the filename to something innocuous. Note that once you set the password for the encrypted folder, you can never retrieve or reset it. If you forget the password, the files inside the folder are lost forever. When creating a password, choose something complex but unforgettable. Cloud storage provides a very simple way of ensuring that your music is always there, wherever you have an Internet connection available. As of this writing, however, Google Drive does not provide a default music player. To hear your tunes you must rely on either portable music player applications or whatever is installed on the host computer. Chrome app DriveTunes provides another option. 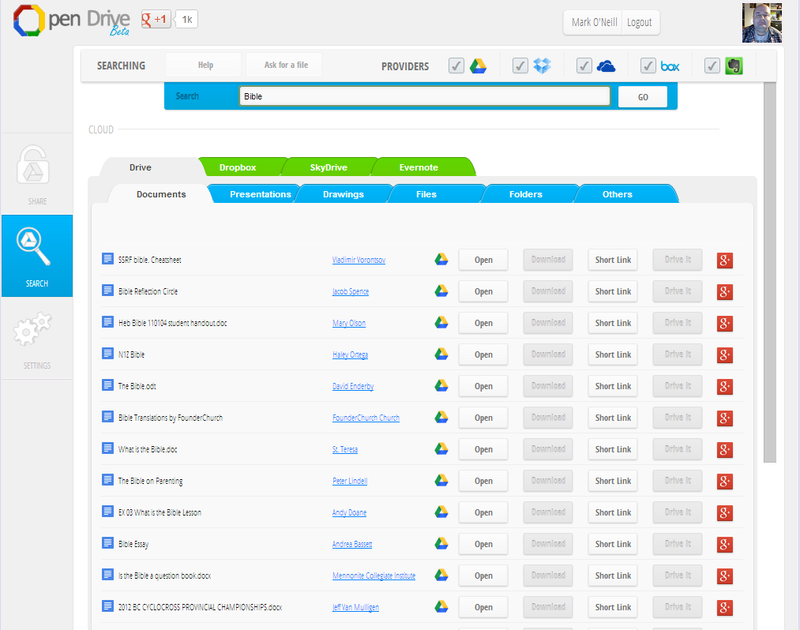 With DriveTunes, you can play all those music files stored on Google Drive. If you use the Chrome browser (either the full installation or the portable version), you can install DriveTunes, which places a music player inside your Google Drive folder. It automatically detects all MP3 and M4A music files inside your Drive and lists them in an easy-to-view interface. Simply double-click a song to hear it. DriveTunes is a basic player with just a play/pause button, a skip-track button, and a volume button. Don’t expect anything fancy like album art, equalizers, or playlists. It plays your music and that’s it. The support of only two audio formats is a current limitation, but the DriveTunes download page claims that the next version will support Ogg and FLAC files. As long as there are businesses, there will be slideshows. But what if you have to develop a presentation with a colleague who’s located elsewhere? That’s where the collaborative power of Google Drive comes into play, and Google’s own Chrome app Google Slides makes collaborating on presentations as simple as your collaborators will let it be. Google Slides saves presentations in real time, sparing you and your coworkers the tears and recriminations that result from saving over each other’s work. As Google’s download page puts it, Slides is good for “shiny 6-pagers or 600 page snoozefests.” In other words, there’s no restriction as to the size of the file (as long as you have the necessary amount of space on Google Drive). You can create slide presentations with a variety of themes and rich animations. You can leave comments on the file for your colleagues—which is much more productive than engaging in endless email threads and tedious telephone conferences. Best of all: You never have to hit a save button. Google Slides automatically and instantly saves everything you do in real time. Beat that, PowerPoint. Sending files and backups to cloud storage is a great idea, but it’s a chore we all too often forget or avoid. The free Web service IFTTT (which stands for If This Then That) aims to make the job easier, by automating all of these tasks in the background, so you don’t have to think about it and do it yourself. IFFTT automates Google Drive tasks so you don’t even have to think about them. The service takes a bit of setup, but once that’s done, you can sit back and let it do its work. IFTTT’s Google Drive section is chock-full of automations (called recipes) made by other users. These recipes are freely available to copy and alter. If you can’t find what you’re looking for, and you can’t tweak an existing recipe to suit your needs, then you can start your own recipe from scratch. Suppose that you want every tweet you make to be stored in a CSV file in your Google account. First you fire up Twitter and give IFTTT permission to access your tweets. Then you tell IFTTT to send the tweet(s) to Google Drive (which will also have to give authorization to IFTTT). 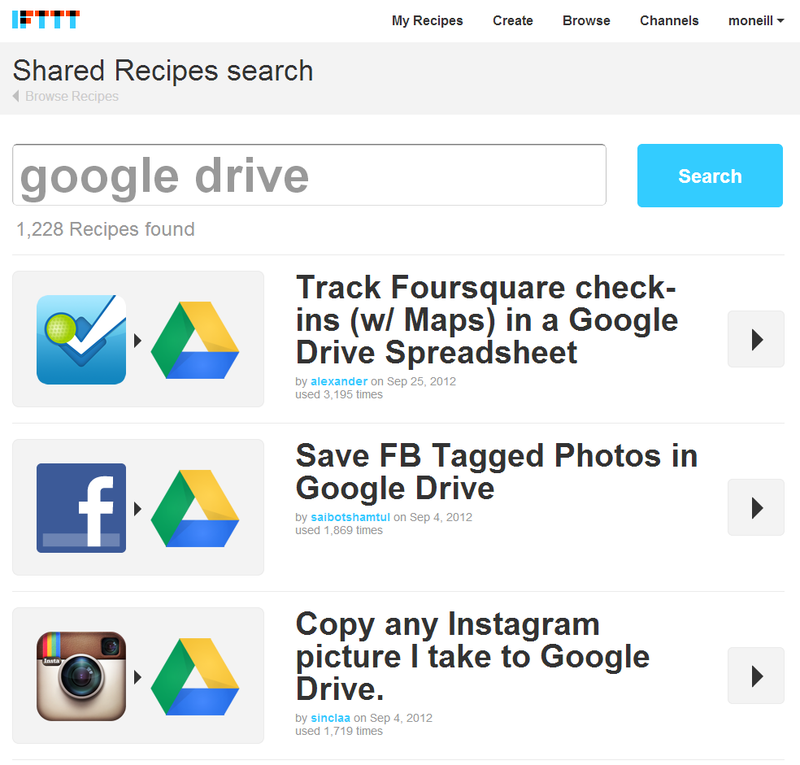 IFTTT’s recipes cover most of the popular Web services. The developer adds new ones all the time, so it pays to check the IFTTT site frequently. Many Google Drive users allow public access to their files, which means you can use Google Drive as one huge file-sharing network. But while you can request a copy of a handy-looking file, you first have to know it’s there. That’s the tricky part. Open Drive makes normally hard-to-search Google Drive an open book. Ironically for a company whose core business centers on search, you cannot directly search for anyone else’s files within Drive, nor can you look for them effectively by using regular Google search. Mcom Multicartes created the Chrome extension Open Drive to provide a search interface for these public files so that you can find them more easily. What’s more, using Open Drive, you can also simultaneously search other cloud-storage systems (such as Dropbox, Skydrive Evernote, and Box) and have those files sent to your Google Drive account. The more cloud services you search at once, the longer it takes. Once you get your results, you can download them, send them to your Google Drive, get a link to the document, or simply open what you find. If your search yields nothing useful, you can join Open Drive’s Google Plus community to request what you need from other members. As with any search engine results, there’s some dross mixed in with the gold. That said, Open Drive found relevant files in most of my searches. 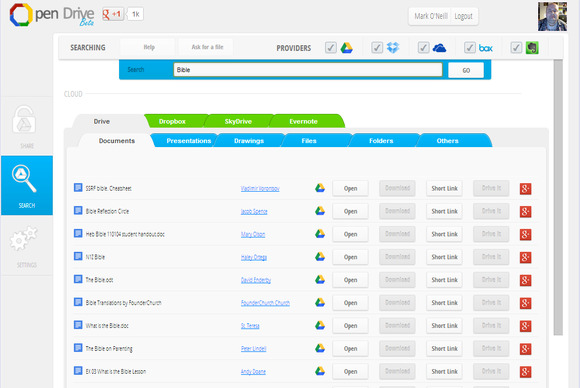 And searching across so many cloud services at once in the same interface is addictively convenient. There are all sorts of ways to supercharge your cloud storage and maximize your free cloud storage. As a devoted Google Drive user, however, I use these tools on a regular basis. They’ve got me covered when it comes to online file encryption, listening to music, searching for public files, automating my personal and professional life, and making snappy presentations. 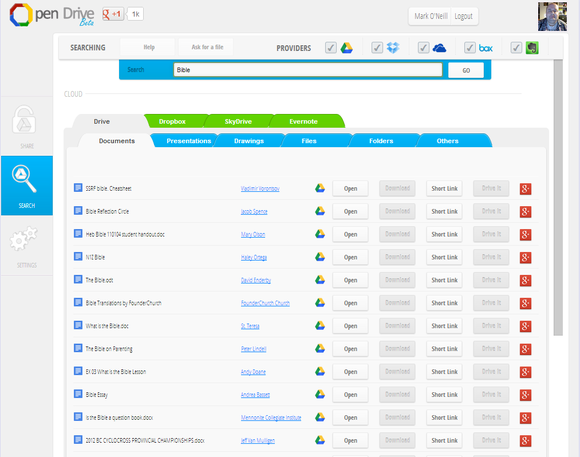 Which plug-ins and tools make your Google Drive experience complete? Let us know in the comments. If you use Google Drive to store oodles of MP3 music, then you may long for a built-in music player. Enter DriveTunes. Powerpoint is common but is part of the paid MS Office. Google Slides provides a free alternative with great collaboration power. Ifttt is a free, fun service that lets you build interesting connections between various pieces of the Web. If you are looking for a document or a template, you would normally Google for it. But a lot of people keep these things on their cloud storage services, and are willing to share. Open Drive indexes them all.